First and foremost who is King James? I'm a 26 yr old rapper residing in Greensboro, NC. I'm also 1/4th of a group called "Peoples Logic", a child of GOD, and a connoisseur of all things hip hop. Is your name influenced by the King James version of the bible or the moniker that is used by Lebron James? I've been rapping since 99 so it's definitely not influenced by Lebron, but it is rooted in the bible. James is my birth name and my relationship with Christ allows me to claim the title of "King." You recently released a project called Heavy Rain. What did your try to present with Heavy Rain? Over my first EP The Introduction I was basically spitting random bars over industry instrumentals. 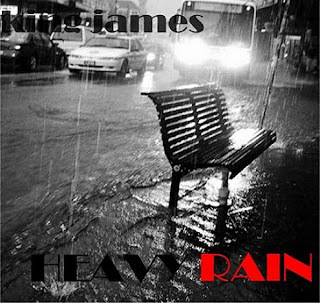 With Heavy Rain most of the production comes from underground beat makers so I really wanted to showcase my ability to write actual songs without sacrificing lyricism. Listening to the project, I can tell that you are a student of lyricism and that you value each and every line. Describe what lyricism means to you and who inspires you to write better lyrics? To me lyricism is more than just rhyming words, it also involves an artist's use of patterns and wordplay. I feel as if these three areas mostly embody what it means to be lyrical. The rapper that mostly inspires me to write better lyrics has to be Elzhi. Top 5 in the game lyrically, hands down! What is your favorite song off of Heavy Rain? My favorite track off of the EP has to be Tick Tock. Even though I'm constantly expanding as an artist that "boom bap" style of hip hop is what I do best, and that's exactly what Tick Tock is. Plus I got the homie Joe Logic on the beat and Chinch 33 on the scratches. You currently reside in a state that is slowly becoming a Hip-Hop Hub (North Carolina). The thing that I appreciate about North Carolina is the unity that is displayed by some of the artists there. Have you ever given thought to working with 9th Wonder or any other North Carolina based artist? I would definitely love to work with 9th Wonder, he's a living legend in this state and before Little Brother I really didn't think seriously about pursuing a rap career. Overall Carolina is filled with talented rappers and I would be honored to work with any of them. What is King James currently working on? Right now our main focus is around our group project titled LooP Dreams that will be released later in the year. The homie Tay Black and I also have another EP titled Riding in Cars With Girls scheduled to drop sometime this summer. S/O to all my Peoples Logic fam, Trillion Dollar Dame, Head Banga ENT, Mars, Chinch 33, Dark Water Quartz, and anybody else that has helped me along the way. Heavy Rain was dope! Keep holding it down for real hip hop.